The entrance to the ancient temple rose out of the lush jungle, its square stones carved with angular images, the last vestiges of ancient paint staining their recesses. Magnusson pulled a lamp from his backpack, lit the wick and closed the front. He led the way through the vast stone maw, down corridors lined with elaborate wall carvings and statues that became increasingly lifelike the further he went. Deep in the temple, their paint protected from the ravages of time, the less stylised figures could almost have been taken for real people. It was amazing. Quehua followed, his footsteps surprisingly heavy in the echoing corridors. “Wonderful!” Magnusson held his lamp up as they entered a large chamber, the walls lined with statues. Images of human sacrifice covered the far wall above a stone altar. “What was that?” Magnusson asked. Curiosity turned to amazement as the statue beside him swung its arm out, then alarm as a stone fist hurtled towards his face. Magnusson ducked just in time, but other statues had started to move and he couldn’t avoid every blow. One kicked his leg out from under him. He turned the fall into a roll and was back on his feet just in time for another blow to crack his ribs. “We have to get out!” he yelled as the statues closed in, steam seeping from their joints. Pushing Quehua ahead of him, he raced back up the corridor towards the entrance. The whole temple filled with sounds of hissing steam and rattling gears. Wall carvings swung at him and flagstones twisted, trying to throw him to the ground. Agile as a puma, he leapt across obstacles and dodged blows, wincing at the pain in his ribs. Stone footsteps thunder after them. As daylight became visible up ahead, a cold, hard hand grabbed his shoulder and pulled him back. Jerked around, Magnusson found himself face to face with the carving of an ancient prince, so delicately painted that the eyes seemed to sparkle with life. As it grasped him by the throat and raised him up, a thin trickle of steam emerged from between the fingers. “Sacrifice,” it said in the ancient dialect Magnusson had spent so many years studying. Even as it squeezed his throat, he was struck by the cruel irony of being killed by the culture that obsessed him. No. He would not give in and die. He swung his lamp at the statue’s head. It burst open, flaming oil pouring down his attacker. Left with only the handle of his lamp, Magnusson jammed the end into the steaming joint by the statue’s thumb, then pulled on it as hard as he could. There was a pop, the thumb flew off and Magnusson fell to the floor. Two wall panels swung out, as if to crush him between them. Spinning on his back, he kicked the legs of the royal statue. His left shin cracked and pain lanced through him. The statue toppled and forward. Magnusson leapt clear just in time. Swinging panels crashed against the statue. It shattered, stone gears and pieces of ancient sculpture flying everywhere. A chunk of rock, still coated in flaming oil from the lamp, hit Magnusson in the side of the head and his vision swam. Forcing himself to his feet, he staggered the last hundred meters up the corridor and out into the sunlit jungle. Everything was a green blur. There were no sounds of pursuit. Gasping with relief, he sank to the ground. A broken bone jutted from his shin, blood seeping into the ground. The world was spinning. Every breath hurt. But at least he was alive. A shadow appeared, a figure standing over him. Dread filled Magnusson, followed by relief as he saw that it was Quehua. Quehua reached down, but instead of taking Magnusson’s hand, cold fingers closed around the explorer’s throat. A thin trickle of steam escaped from between them. “Sacrifice,” Quehua said as he squeezed. 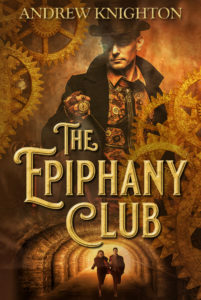 If you’d like a free e-book containing more of my steampunk stories then just sign up to my mailing list. You’ll get a free copy of Riding the Mainspring and stories like this straight to your inbox every Friday.